In the June 2 Neurology, researchers make a strong case that blood levels of neurofilament, a protein released from motor neuron axons, forecast how quickly amyotrophic lateral sclerosis will progress. The marker might help clinicians identify suitable participants for clinical trials, and quickly determine whether they respond to treatment, said senior author Martin Turner of the University of Oxford in the U.K.
High levels of neurofilament in blood or cerebrospinal fluid suggest a fast-moving version of ALS. 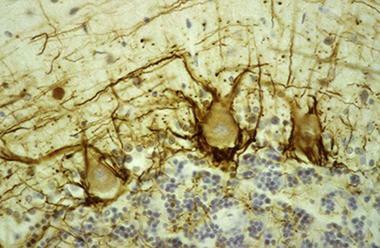 Here, antibody staining (brown) for the heavy subunit of neurofilament in the human cerebellum highlights the axons of basket cells surrounding Purkinje cells. Neurofilaments provide structural support for axons. They are made of three subunits: light, medium, and heavy. When neurons are injured, they leak neurofilament subunits, which can make their way into the cerebrospinal fluid and from there to the bloodstream. Many scientists have investigated the possibility of using leaked neurofilament as a biomarker for neural damage in ALS and other neural conditions (Skillback et al., 2014; Scherling et al., 2014; McCombe et al., 2015). In the current study, Turner and co-senior author Andrea Malaspina of Queen Mary’s University, London, addressed a gap in the literature. There is little understanding of how neurofilament levels in patients change over time, though one study looked at the heavy subunit in serial blood tests (McCombe et al., 2015). Turner and colleagues analyzed neurofilament concentrations over time in two ALS cohorts, one at Oxford and one at Queen Mary’s. First author Ching-Hua Lu, of Queen Mary’s, used an electrochemiluminescence assay to detect the light subunit of neurofilament (Gaiottino et al., 2013). They applied this assay to blood, CSF, or both, from 167 people with ALS and 78 healthy controls. Samples were taken at baseline, then every two to six months, for up to 15 months. People with ALS always had more of the light chain in their CSF than controls did, and blood levels of the protein were nearly as good at distinguishing disease. However, for each person, the neurofilament light chain levels in both blood and CSF remained fairly constant throughout the study. To correlate neurofilament levels with progression, the researchers tracked symptoms on the standard, 48-point ALS Functional Rating Scale. A decline of 0.5 to 1.0 point per month is considered average. Those who progressed faster had more neurofilament light chain in their blood than those on a slower course. High neurofilament also correlated with shorter survival. “I think neurofilament light chain is now our leading biomarker candidate,” Turner said. Clinical trialists might see changes to a person’s neurofilament levels in just a couple of months, he speculated, instead of waiting a year or more to determine if a treatment improved survival. “This study was rigorously conducted and showed clear results,” commented Adam Boxer of the University of California, San Francisco, who was not involved in the work. He called it “strong confirmation” of previous studies suggesting neurofilament as an ALS biomarker (Tortelli et al., 2012). Boxer speculated that having a simple, robust blood test would make it easier for patients to participate in a clinical trial. Instead of traveling to a trial center for extensive analysis a dozen times or more per year, they could have their primary care physician collect a blood sample. Would neurofilament also be useful to diagnose ALS? Turner and Boxer were less sure. Neurons release neurofilament whenever they are injured, so its presence in the blood may not help distinguish ALS from other neurodegenerative or neurological conditions. To test the diagnostic potential, Turner is currently measuring neurofilament levels in people suspected to have ALS or a mimic condition. Lu CH, Macdonald-Wallis C, Gray E, Pearce N, Petzold A, Norgren N, Giovannoni G, Fratta P, Sidle K, Fish M, Orrell R, Howard R, Talbot K, Greensmith L, Kuhle J, Turner MR, Malaspina A. Neurofilament light chain: A prognostic biomarker in amyotrophic lateral sclerosis. Neurology. 2015 Jun 2;84(22):2247-57. Epub 2015 May 1. [PubMed].